New images have been taken and rendered of the RMS Titanic, the famous ship that sank on her maiden voyage, taking over one thousand souls to the bottom of the ocean. Dubbed unsinkable before her trip, the Titanic struck an iceberg, snapped in two, and fell to the bottom of the ocean. 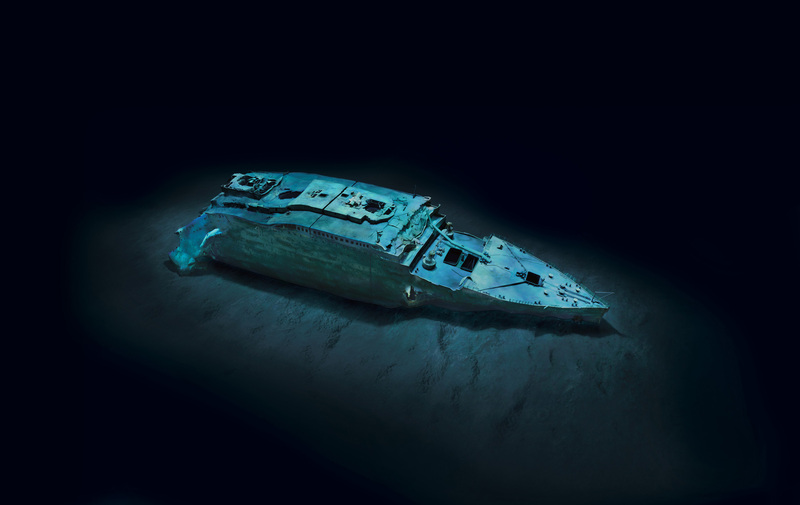 Given the depth of the wreck, and its remoteness, securing quality images of the disaster site has been difficult. Happily, fresh images are out in the April 2012 edition of National Geographic magazine that give a raw perspective on the tradgedy, and its aftermath. We’ve been given permission to post several of the images. Normally, we don’t place onerous rights information after each image we bring to you, but this time around, the rules are out of our hands, and we really wanted to share these with you. Enjoy. COPYRIGHT© 2012 RMS TITANIC, INC; Produced by AIVL, Woods Hole Oceanographic Institute. The first complete views of the legendary wreck. Ethereal views of Titanic’s bow offer a comprehensiveness of detail never seen before. The optical mosaics each consist of 1,500 high-resolution images rectified using sonar data. COPYRIGHT© 2012 RMS TITANIC, INC; Produced by AIVL, Woods Hole Oceanographic Institute. The first complete views of the legendary wreck. Titanic’s battered stern, captured here in profile, bears witness to the extreme trauma inflicted upon it as it corkscrewed to the bottom. COPYRIGHT© 2012 RMS TITANIC, INC; Produced by AIVL, Woods Hole Oceanographic Institute. Modeling by Stefan Fichtel. Ethereal views of Titanic’s bow (modeled) offer a comprehensiveness of detail never seen before. COPYRIGHT© 2012 RMS TITANIC, INC; Produced by AIVL, Woods Hole Oceanographic Institute. The first complete views of the legendary wreck. As the starboard profile shows, the Titanic buckled as it plowed nose-first into the seabed, leaving the forward hull buried deep in mud—obscuring, possibly forever, the mortal wounds inflicted by the iceberg. 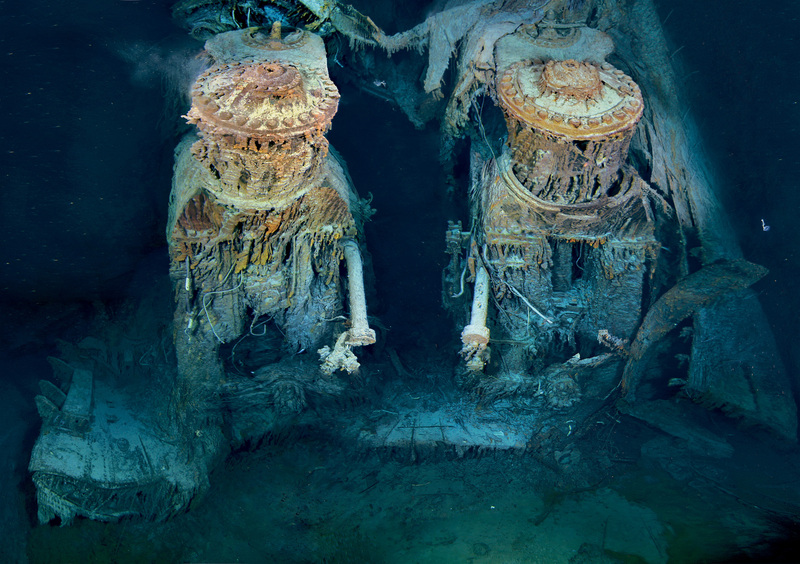 COPYRIGHT© 2012 RMS TITANIC, INC; Produced by AIVL, Woods Hole Oceanographic InstituteTwo of Titanic’s engines lie exposed in a gaping cross section of the stern. Draped in “rusticles”—orange stalactites created by iron-eating bacteria—these massive structures, four stories tall, once powered the largest moving man-made object on Earth. Like we said, those were worth the hassle. Now get back to work!